However, there are some unconfirmed reports of intimidation elsewhere in the Niger Delta. Reuters news agency reports that there are far fewer international election observers present than during previous polls, partly because the entire election cycle was delayed by a week. Some election officials are doing national youth service and did not turn up after their colleagues were targeted during the previous violence. The National Youth Corps workers do their service away from their home state and so are seen as vulnerable when violence breaks out. It is not yet clear to what extent their absence has affected the polling. European Union and US diplomats have issued a joint statement sharply criticising those behind violence and warning all of Nigeria's leaders to behave responsibly. 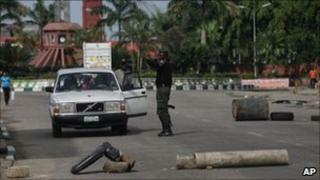 The police commissioner in Maiduguri said no-one had been hurt by Tuesday's bombs. Previous bombings in the city were blamed on the Boko Haram Islamist group which has staged frequent attacks in recent months. One man told the BBC that he was a passenger in a bus which went over a bomb disguised as rubbish and left in a pothole in the road. "When we got there and drove over the bit of rubbish the bomb then exploded. One tyre burst underneath us with a loud noise," he told the BBC's Focus on Africa programme. Another man said there were hardly any queues at polling stations in the city, in contrast to previous elections. A total of 24 states out of 36 held their gubernatorial elections. Several delayed federal legislative polls also took place. Ten governors took office years after winning their legal challenges against the 2007 elections and so new polls will not be held in those areas. The elections were postponed until Thursday in Kaduna and Bauchi following clashes last week after President Goodluck Jonathan was declared the winner. Correspondents say the governing People's Democratic Party faces a strong opposition challenge in several areas and is expected to lose some state governorships. The electoral marathon began with legislative polls on 9 April. Mr Jonathan, a southern Christian, was appointed to the presidency last year upon the death of incumbent Umaru Yar'Adua, a northerner whom he had served as vice-president. Many in the north felt the next president should have been from their region, as Mr Yar'Adua died before he could finish his term. Former military ruler Muhammadu Buhari won most of the mainly Muslim northern states but nationwide only gained half as many votes as President Jonathan. Analysts say the violence has more to do with poverty and economic marginalisation in the north than religion. The north and south also have cultural, ethnic and linguistic differences. Despite the violence, most observers said the elections had been among the best organised since the return of civilian rule in 1999.